Cowa is a lesser known edible fruit found in the states of East India (Assam, Mizoram, Bengal, Bihar and Orissa). It is also found in the Andaman and Nicobar Islands. It occurs wild frequently in evergreen and semi evergreen forests or along streams in deep valleys. 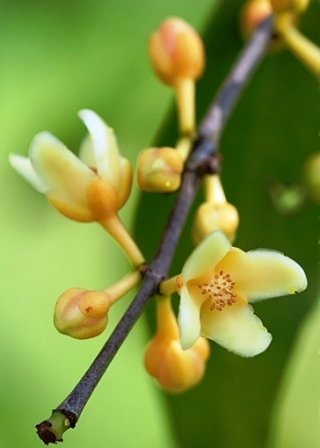 Besides India, it is also reported to grow in South China, Bangladesh, Malaysia, Laos, Cambodia and Vietnam. In Mizoram, cow is cultivated as a subsidiary crop in Citrus, banana and arecanut orchards. 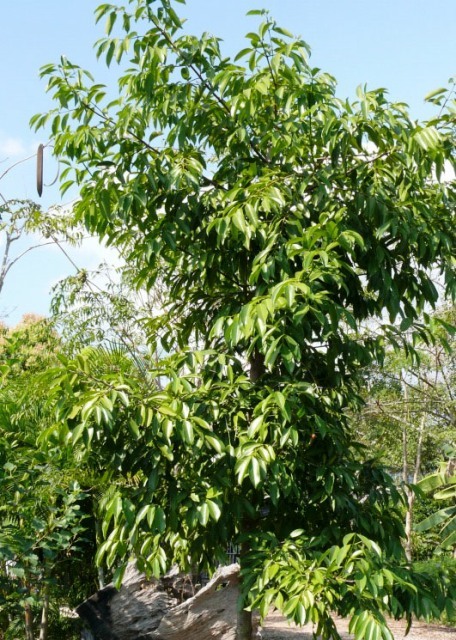 Trees 8-12 m tall, 15-20 cm in diam; bark dark brown; branches many, borne toward top of trunk, horizontal but usually distally pendulous, slender; twigs dark brown, striate. Petiole 0.8-1.5(-2) cm; leaf blade lanceolate or oblong-lanceolate, 6-14 × 2-5 cm, papery, midvein raised abaxially, impressed adaxially; secondary veins 12-18 pairs, near margin joining together; tertiary veins conspicuous on both surfaces, base cuneate, sometimes slightly decurrent, margin cartilaginous, involute, apex acuminate or long acuminate, rarely acute or obtuse. Dioecious; male flowers 3-8, terminal or axillary, in an umbel; umbel shortly pedunculate or rarely sessile, 4-bracteate at base; bracts subulate; pedicels 4-8 mm, slender; petals yellow, ca. 2 × as long as sepals; stamen fascicles 4, connate, forming a central capitate 4-sided mass of 40-50 anthers; filaments ± absent, at most short, anthers 4-celled, cells longitudinally dehiscent; pistillode absent; female flowers usually solitary, axillary, larger than male; pedicels robust, 2-3 mm; staminodes united in lower half and enveloping ovary base; filaments long or short, usually shorter than ovary; ovary ovoid, 4-8-loculed; stigma radiately 4-8-lobed, papillate, 6-7 mm high. Fruit opaquely yellow-brown, ovoid-globose, oblique, 5-6 × 4-5 cm in diam., 4-8-sulcate, usually apiculate, pinkish red, looking similar to tomato. Seeds 2-4, narrow, fusiform, slightly curved, ca. 2.5 cm, rough. The fruits are edible. In spite of their being slightly sour in taste, these are fondly eaten by local people especially in Mizoram. The fruits are also made into jam and preserve. In East India, the sun dried slices of this fruit are used to treat dysentery. 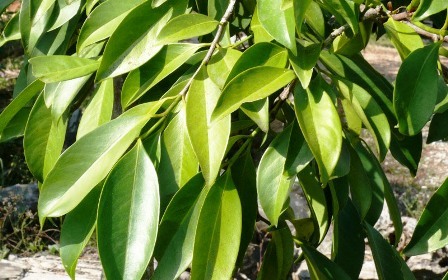 The young leaves are cooked and eaten as a vegetable. The bark is used for dying clothes yellow. 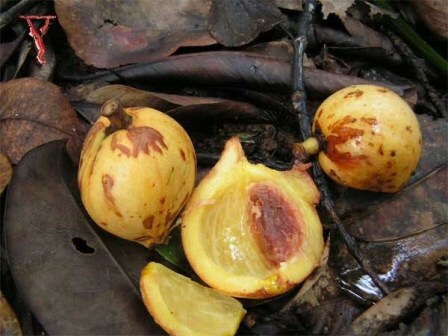 Cowa tree also produces a yellow gum resin which resembles gamboge. New trees are raised from seed. These are planted at a distance of 8 m from each other the bearing starts in 4-5 years.